South of U.S. Route 4, one mile west of Andover Village on Lorden Road over the Blackwater River in Andover. The bridge is 64'6" long with a clear span of 54'2". It has an overall width of 18'9" with a roadway width of 15'10" and a maximum vertical clearance of 12'0". It is partially sheathed on the sides and has a deep overhang reminiscent of the rakish prow of a ship. The bridge is posted for six tons. The structure of the bridge was built by Albert R. Hamilton. The bridge's name, Keniston, came from a prominent family of that name who lived for many years in one of the old homesteads in town. The bridge has been damaged only once, in 1972, when ice tore off several planks. 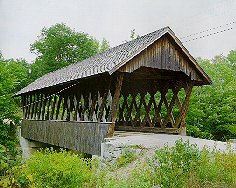 The bridge was rehabilitated by the town in 1981 at a cost of $80,000. During the rehabilitation process, the bridge was lifted by two cranes and moved to a temporary site only a few feet above the water level. The engineers had to work quickly to make sure the abutment repairs were completed and the bridge relocatd to its proper location before heavy rains and rising waters could carry it away. The Keniston Bridge is listed on the National Register of Historic Places.